Willmott Dixon’s private rental firm Be:here has agreed a deal to purchase 3.9 acres of the 9-acre Abbey Retail Park site in Barking from the Estate & Agency Group. Subject to planning consent, on this site they plan to develop approximately 650 flats for the private rental sector (PRS) and subsequently manage these properties. Abbey Retail Park lies on Abbey Road, a short walking distance from Barking’s mainline train and underground station. This latest deal means the Be:here will soon have over 1300 homes in its PRS portfolio. 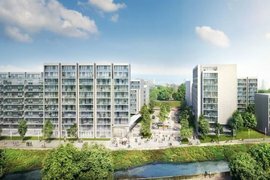 The company has seen recently completed the development of 158 homes in East India, east London, soon to be made available to private renters, as well as another 132 homes at the Old Vinyl Factory in Hayes, west London. Chief Executive of Willmott Dixon’s development division, Andrew Telfer, said: “Barking is a key milestone in Be:here’s plans to create vibrant rental communities at scale across London and other major cities. Iceni Projects has been appointed as the lead consultant on the project. They are supported by twelve architects, Broadway Malyan, and development managers i2. The project is expected to commence in early 2016, subject to planning permission which is now being worked on. The first homes will be available to rent in 2018 if planning is approved.